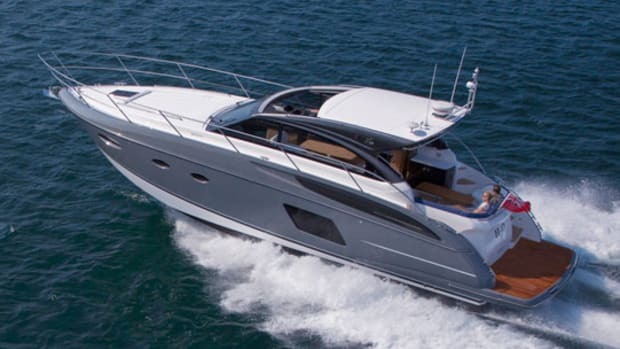 The Princess 60 Flybridge is British-born and American-bred. 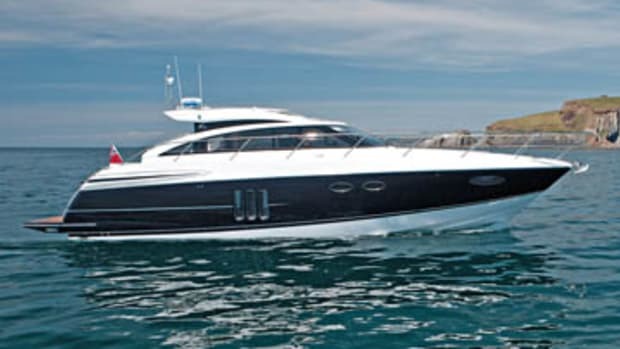 The history of Princess Yachts in the United States is an often-told saga, but still an interesting and instructive. one. The English builder started life in 1965 with a luxurious (for the day) 31-footer and quickly grew into one of the U.K.’s most successful shipyards. By the 1980s, Princesses were fixtures in marinas all over Europe, and not much later, all over the world—with one notable exception. 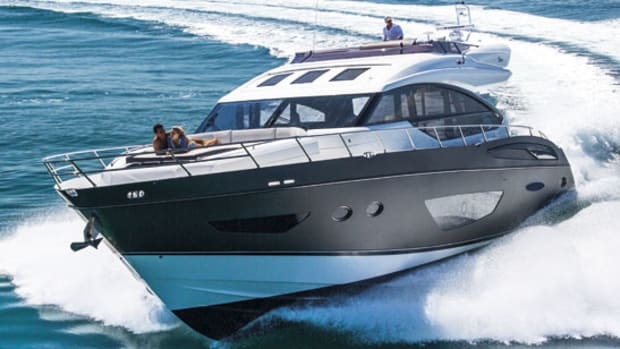 It never established a foothold in what is arguably the most lucrative boating market in the world: the United States. 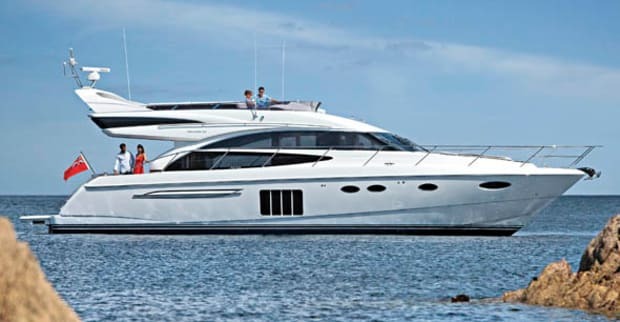 That changed in 1995 when Princess combined forces with Viking Yachts, the powerhouse convertible builder that until then had enjoyed only mixed success building motoryachts. The partnership, which spawned a new and separate division of Viking, was unique in that Princess continued to design and build the boats in the U.K. but modified them—quite extensively in some cases—to suit American tastes as delineated by Viking. There was real synergy, with both sides learning from the other, and it was not about just fabric swatches and color samples. These boats were truly Americanized thanks in large part to shipping containers full of U.S.-sourced equipment that regularly made their way from New Gretna, New Jersey, to Plymouth, England. 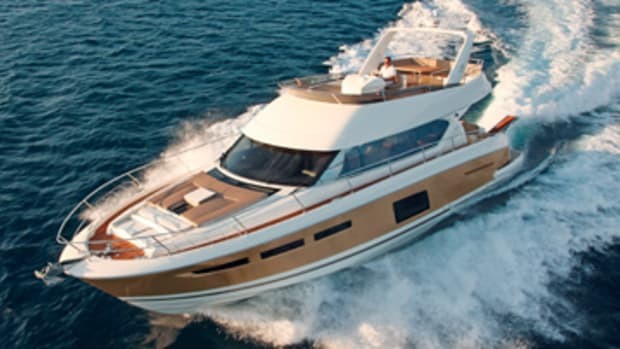 The strategy was risky but it paid almost immediate dividends: Viking Sport Cruisers, sold mostly through the established Viking Yacht dealership network, were an almost immediate hit. 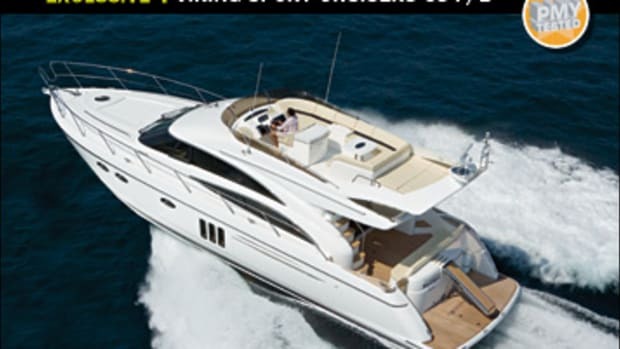 But in the fall of 2010 the name on the boats changed from Viking Sport Cruisers to Princess. (The U.S. company’s name has not changed.) Why? A big reason is simply that the world had come around to America’s way of thinking. 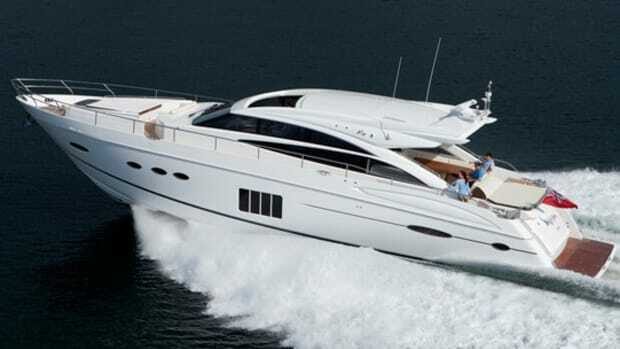 That is to say, most of those modifications to boats bound for America worked so well, they ended up being popular with European boaters to the point that they became standard or optional equipment on all Princess models. Viking still ships containers to Plymouth, but far fewer and mostly full of things like electrical appliances and TVs, which are designed to run on 60-Hz U.S. juice, as well as some fabrics and interior materials. 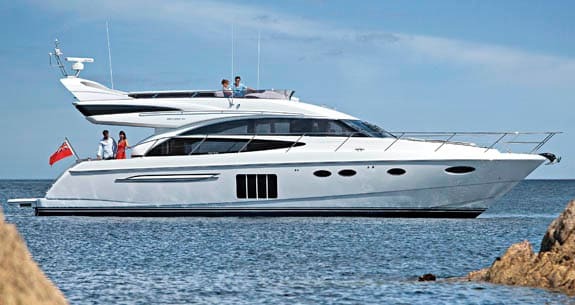 In short, the joint venture has produced a single line of yachts that can be spec’d to suit most of the world’s buyers. 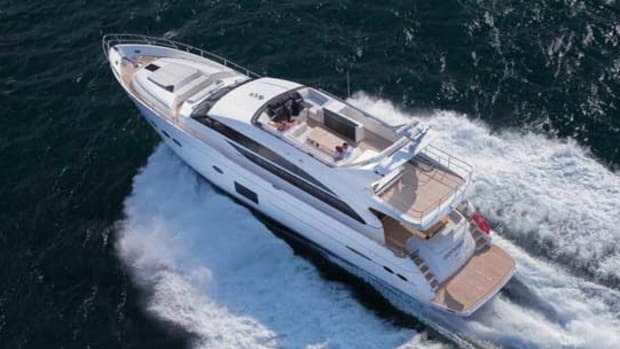 If you want to see just how American an English yacht can feel, step aboard the new Princess 60. She replaces the 58, which was introduced in late 2007 as a 2008 model. There are two big differences between the pair. One is the galley: On the 58 it’s down and to port while on the 60 it’s up and to starboard, right aft of the helm. Americans have always preferred their galleys up, mainly because they want the cook (who’s usually an owner, not a crewmember) to be part of the social scene and enjoy the same views and conversation as other passengers. What makes this change noteworthy is that Princess moved the galley up without disrupting two key main-deck areas: the saloon and the port-side U-shape dinette. The 60 has only one U-shape sofa, where the 58 had two facing each other. 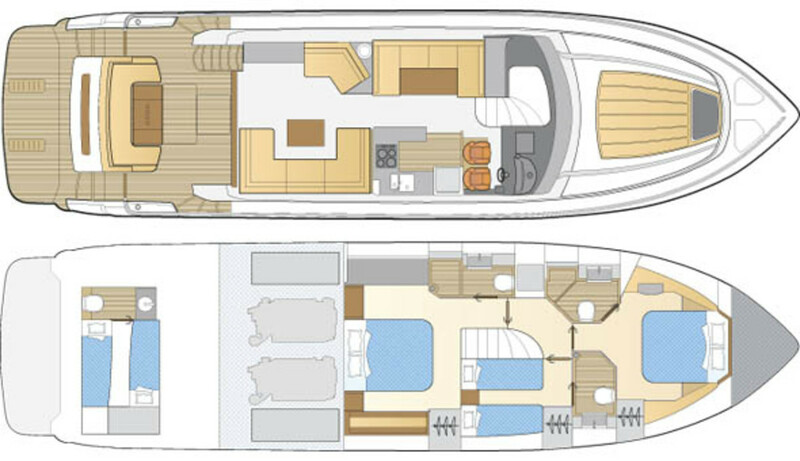 But there’s still enough seating to accommodate a party of eight, and now the main seating is focused on the port-side retractable TV, arguably more practical than facing an opposite settee as on the 58. So by parceling out an additional 2&apos;5" of length (beam and draft are unchanged) in exactly the right places and increasing the glass area on both levels, Princess created a vessel that feels spacious and offers real American-class elbowroom. Likewise on the bridge they replaced the very European centerline helm with a port-side arrangement, which allows for a larger U-shape settee, table, and aft sunpad and makes the space a lot easier to walk around in. One final area of improvement is the cockpit. It’s marginally longer but the big difference is port and starboard access to the swim platform instead of just port-side access. The trade-off is a smaller aft settee (the 58’s extended to the starboard gunwale) but one still big enough to comfortably hold four adults. What hasn’t changed? Performance. I tested the 58 and 60 with identical engines—865-hp C15 CATs—and their test numbers are virtually identical. The 60’s about two mph slower and gets about ten percent less fuel economy above 1750 rpm, but a difference that small could be due to most anything, including the snotty weather on the 60’s test day. Both boats also were equipped with Sleipner electronic steering, and I am delighted to report that the annoying ratcheting and kick-back that I saw on the 58 are gone, and feedback and response are even better. The idea of building one boat that can suit everyone in the world is obviously unrealistic. Tastes vary, even among boaters in the same country, and there will always be those who for whatever reason want a galley down or more, smaller staterooms. 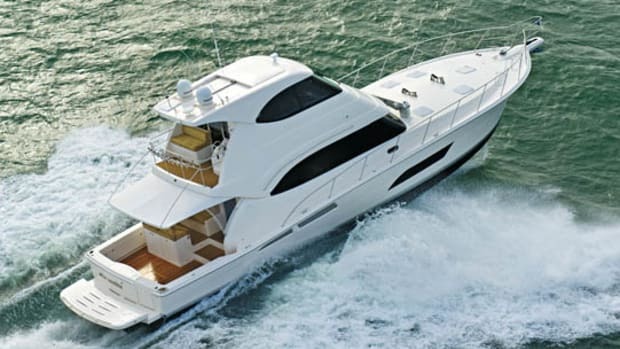 But this 60-footer has the kinds of features that more boaters in more places are looking for today, and that should be enough to make her a hit no matter what nameplate she bears. 400 gal. fuel, 210 gal. water, 2 persons, 500 lbs. gear.